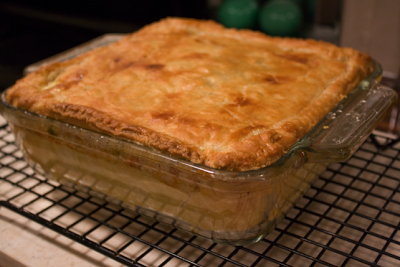 #420 Chicken Pot Pie. – Laurel Mercantile Co.
Now reading: #420 Chicken Pot Pie. Tear off all the meat from the chicken, set aside (I put it in the plastic lid of the chicken carrier so I could just throw it away afterward). In a really big skillet, melt the stick of butter on medium heat. Add the green onions and flour while whisking. Let them cook for about 3 minutes, then whisk in chicken broth and bring to a boil while whisking CONSTANTLY. Right when it starts bubbling, remove from heat. Add the chicken, hashbrowns, peppers, onions, and carrots to the cream sauce and stir together. Salt and pepper to taste. Place 1 sheet of puff pastry in the bottom of a 9 x 9 casserole dish, spoon in the chicken/cream sauce mixture. Top with 2nd puff pastry sheet and use a fork to press and seal the edges. Whisk 1 egg and a tablespoon of water together and brush on top of pastry crust. Put the dish on a cookie sheet in case it bubbles over a little, then bake for 55 minutes. Let stand for 15 minutes before serving. SO good, y’all. I swear. And about a million times easier than my mama’s from-scratch pot pie.